The Ink Trap: SCACD Elements Rubber Stamp Blog Hop! Hey, all! SCACD is releasing four rubber stamps which are collectively called The Elements Collection. The inspiration for them is by all that is going on in nature at the moment. Thoughts of water, wind, fire and earth so powerful in nature captured in these women thru collaboration with SCACD Artist Carmen Medlin. The fab SCACD Design Team along with amazing Guests Designers has created an inspiring hop showcasing the new SCACD rubber stamps. If you missed part of the hop list then check out all the details at the Store Blog today! Now available in the USA are the SCACD April 7th rubber stamp release HERE. SCACD Digital images for USA and International can always be found HERE. For locating SCACD rubber stamps, including the New Release, our International Friends please check out Quixotic Paperie HERE!!! So happy and honored to have been invited to join this new release hop today. You should have arrived here from my wonderful blog buddy's page, Alaine. 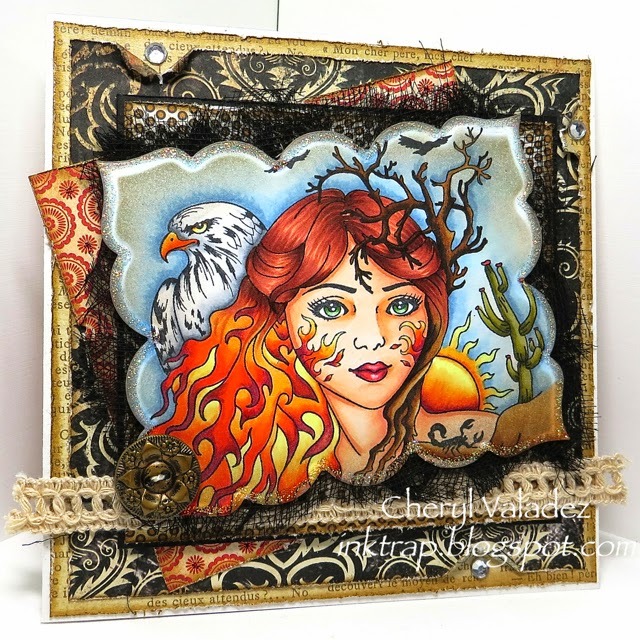 Your next stop on this new release whirlwind is the blog of the super talented Christine. There you're sure to be met with some gorgeous eye candy. If you lose your way and need to get back on track, just head to the SCACD Store Blog. Thanks so much for stopping by today! Until next time, stay crafty! Such a striking image and stunning colouring! wow, stunning card. Such a wonderful image. Um. Echoing Elaine. "Not sure you did her justice"? Are you insane? <---my comment. Quoting Elaine again, "Absolutely rocked it. Gorgeous vibrant color. LOVE! :D"
You absolutely, positively rocked it. Your coloring, shading, and shadowing is fabulous! Your card design is stellar! I freakin' love everything about this card. Gorgeous love the layers and colors, just Amazing! Wow, this is so beautiful! Outstanding job, Cheryl! O. M. G.! And the colors are PERFECTION. You captured the desert so well!. Love your colors on the sun! You are seriously a coloring goddess that I worship!!!! This is beautiful! Your colouring is superb! Freakin' awesome coloring on a fab image.